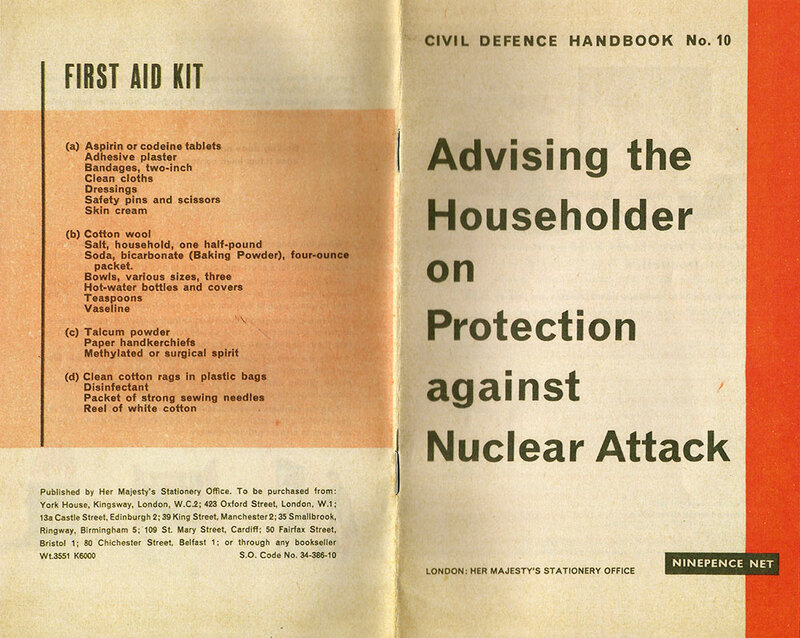 Advising the Householder on Protection against Nuclear Attack. Ninepence! 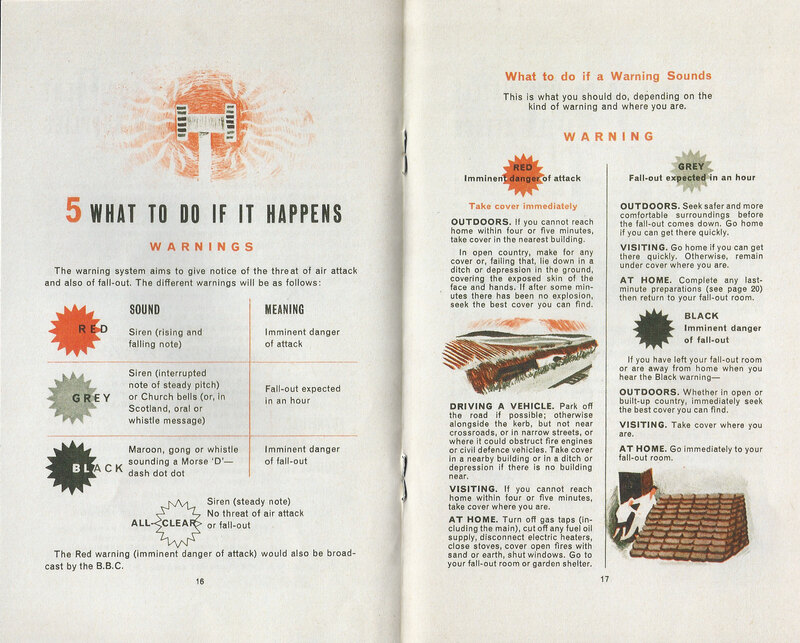 Scans from a nuclear war information booklet issued by Her Majesty’s Stationery Office in 1963. People of Britain, gather your Vaseline, paper handkerchiefs, teaspoons and aspirin so we can get on with a proper British apocalypse. I’m more into the mod design than the details of people being killed instantly. “HEAT”, “BLAST” and “FALL-OUT” each have exciting logos. Which is nice. I haven’t scanned them, but some of the other pages mention living in a hole in your back garden with a dustbin lid as a hatch, or building a “fall-out room” made of doors and sandbags inside your house. It’s grim. 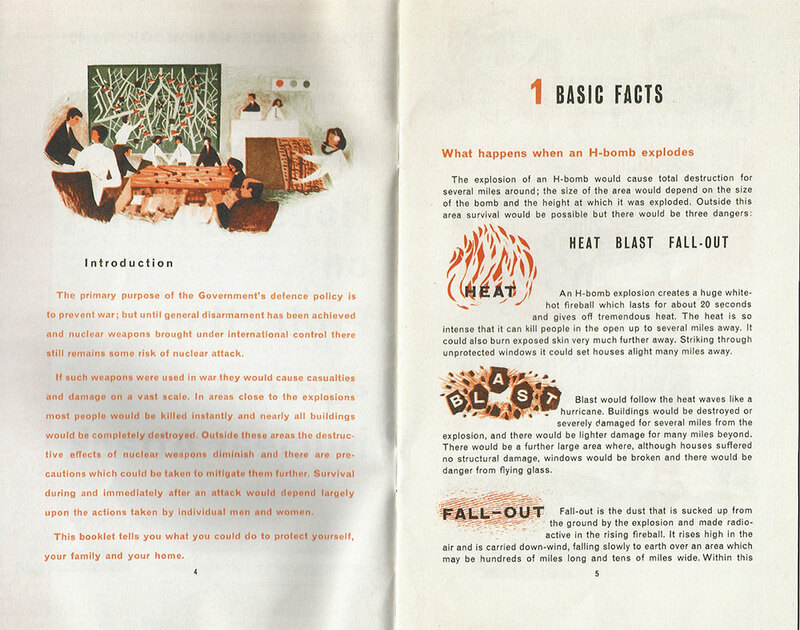 The booklet’s main achievement is making it seem lucky if you’re one of the people vapourised or incinerated during the initial blast. Most of the advice for survivors comes down to staying indoors with your family and waiting for help that may never come. It’s like an even more depressing and futile than usual episode of Eastenders. Her Majesty’s Stationery Office does allow that there may be an interruption of water supplies and electricity; many people in British cities had experienced this during WWII, so it wasn’t too scary to admit the possibility. As for absurdities like putting out your rubbish to be collected after an H-bomb has dropped nearby or using Sellotape and a raincoat against radioactive fallout, I’m not sure if the government really thought that after a nuclear exchange everyone would be resuming their normal lives within a few days or weeks, or if this was just the impression the authorities hoped to give people.